Zeb's General Store was recognized in the October 2018 issue of Architectural Digest as The Most Beautiful Store in New Hampshire. The magazine presented its selection of the best looking stores in every state in the country. 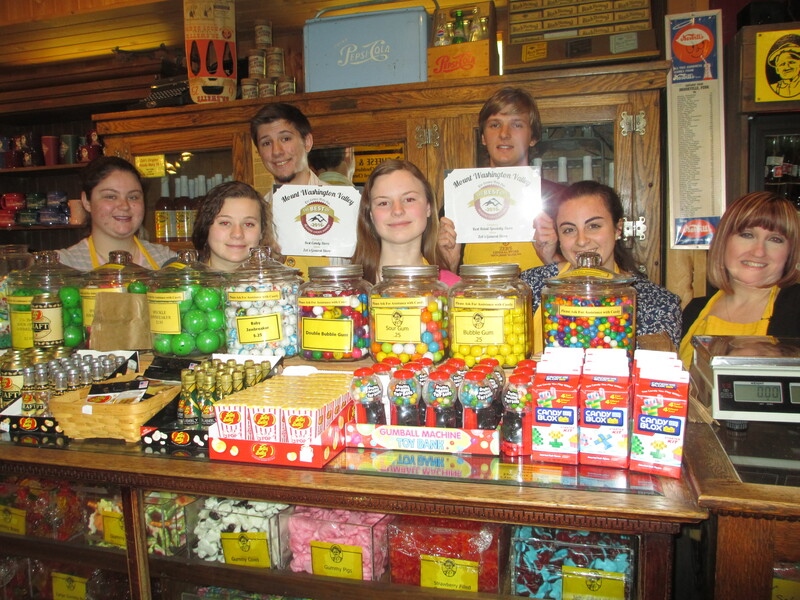 For the Third year in a row, Zeb's General Store was voted as the Best Candy Store and the Best Retail Specialty Store in the Mt. Washington Valley by the readers of the Conway Daily Sun. Truly an honor again as this represents recognition by our local friends and neighbors. For the second year in a row, Zeb's General Store was voted as the Best Candy Store and the Best Specialty Gift Store in the Mt. Washington Valley by the readers of the Conway Daily Sun. Truly an honor again as this represents recognition by our local friends and neighbors. Co-owners David Peterson and Peter Edwards awarded the Bob Morrell Award by the Mt. Washington Valley Economic Council in recognition of 25 years of community service and charitable giving. Voted as the Best Candy Store and the Best Specialty Gift Store in the Mt. Washington Valley by the readers of the Conway Daily Sun. Truly an honor as this represents recognition by our local friends and neighbors. Zeb's General Store has been awarded a Certificate of Excellence by TripAdvisor. This prestigious recognition places Zeb's in the top 10% of businesses worldwide on TripAdvisor. A certificate of excellence by TripAdvisor is achieved by receiving an average rating of 4.5 or higher, in a 5 point rating system, over the course of a year from over 50 reviewers. This form of recognition is extremely gratifying as it comes directly from customers who have made a special effort to express their satisfaction with their shopping experience at the store. For the third consecutive year Zeb's General Store was selected as the best Country Store in New Hampshire by Boston Magazine in their 2010 New England Travel Guide. Boston Magazine ran their own contest for country stores and judged Zeb's as the very best. The travel guide stated that Zeb's had "a mind blowing selection of syrup, honey, handmade soaps, pancake mixes, scrubs, lotions, salsa, cheeses, and home decor that is laid out over the store's two spawling levels". Zeb's General Store was recognized by Country Business Magazine as its Retailer of the Year for 2009 in the February issue of its magazine. Country Business Magazine is a publication with over 30,000 subscribers. It serves the gift buying needs of the nation's independent gift retailers. Each year the magazine recognizes an outstanding retailer that offers a unique shopping experience that has proven the test of time to have a successful business model. The editorial in the February issue of the magazine commented, "Zeb's General Store is a business that keeps improving, and it is a business that is definitely worthy of our Retailer of the Year award." 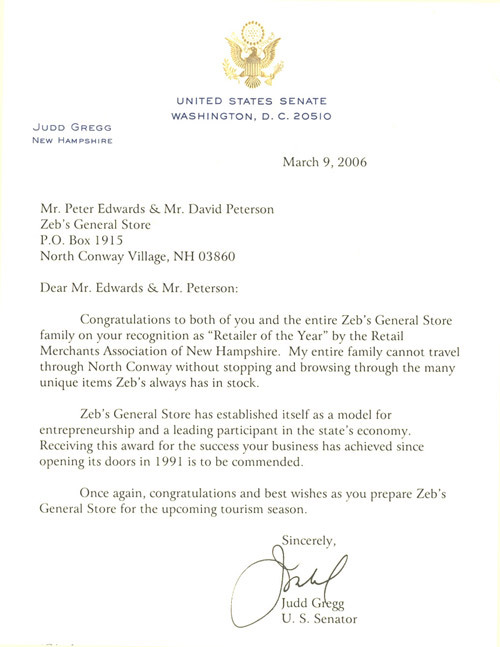 The feature article in the magazine about Zeb's states, "catering to a loyal customer base of local residents and out of town tourists alike, co-owners Peter Edwards and David Peterson have built Zeb's success on a reputation for both quality and caring, which were two of the reasons they were our pick for this year's Retailer of the year". 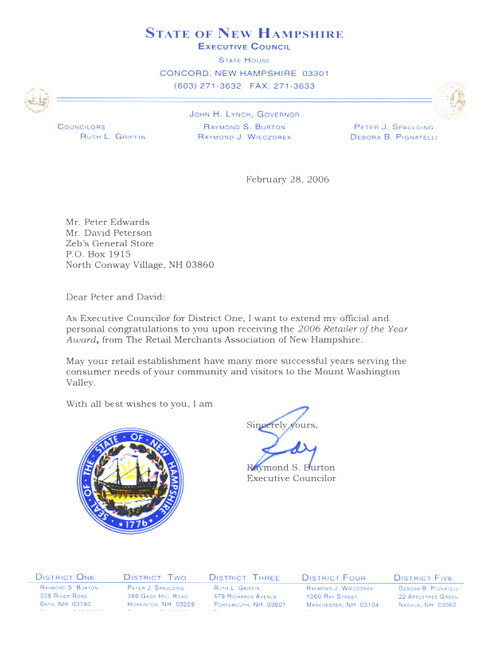 Zeb’s General Store was recognized by the Retail Merchants Association of New Hampshire as the 2006 Retailer of the Year at the association’s 40th Legislative Reception in Concord, NH. The Retail Merchants Association of New Hampshire selects an outstanding retailer each year for this award based on the overall success of the business model, the level of customer service provided by the retailer, and the company’s contribution to its community and the retail industry. Zeb’s was nominated for this award by Janice Crawford, Executive Director of the Mt. Washington Valley Chamber of Commerce. 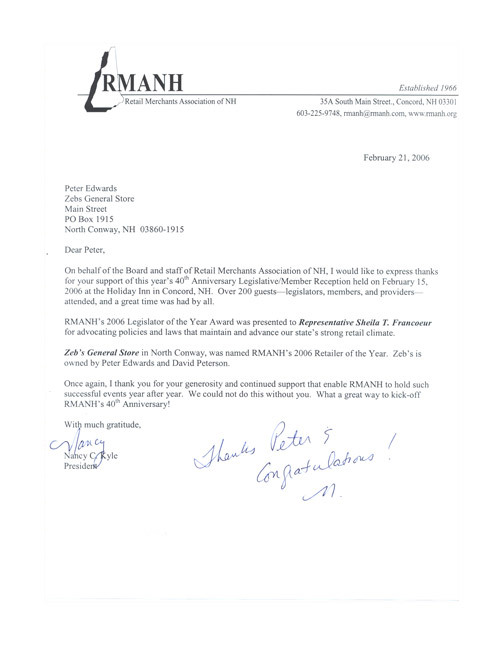 Letters of support were provided by the Mt. Washington Valley Economic Development Council and Monarch Events. Zeb’s was honored at a presentation on March 25th as the Pride of New England for the 2006 Boston Gift Show. This award is especially rewarding for Zeb’s as the store was nominated by several of its suppliers. The Pride of New England Awards honors outstanding retailers for excellence in customer service, creative merchandising and community involvement. Boston Gift Show exhibitors nominate retailers from throughout the New England area with six winners selected from each of the New England states. Zeb’s General Store received the award as the 2006 Retailer of the Year by Business NH Magazine at a reception on May 25, 2006 at the Radisson Hotel in Concord, NH. Over 500 business and legislative leaders from all over the sate attended the ceremony. Contestants are nominated by their respective Chambers of Commerce and the selection is made by the winners of prior year awards. The criteria was similar to that of the Retail Merchants Association of New Hampshire award and Pride of New England honor, with a strong emphasis on community involvement.